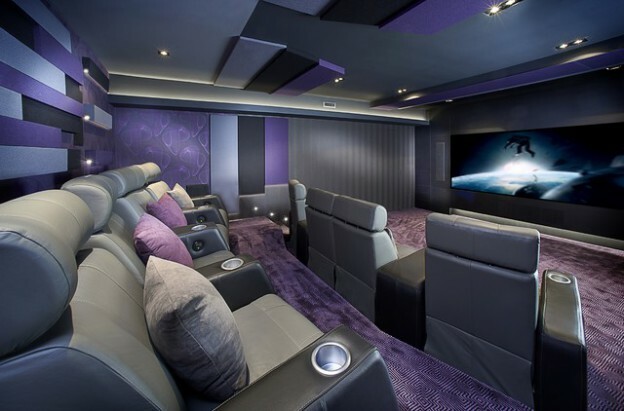 It’s one thing to dream about your ideal home theater but when push comes to shove, bringing it to life can certainly be daunting. There are many decisions to be made between the layout, color scheme, theme, and furniture style. If you’re wondering where to start, fear not! We’re here to help guide you through the entire process. Follow this guide to start designing a home theater that will put your local cinema to shame. Selecting a screen or projector is the first step to building your home theater. The placement, size, dimension, and style of screen will determine the setup of the entire room. 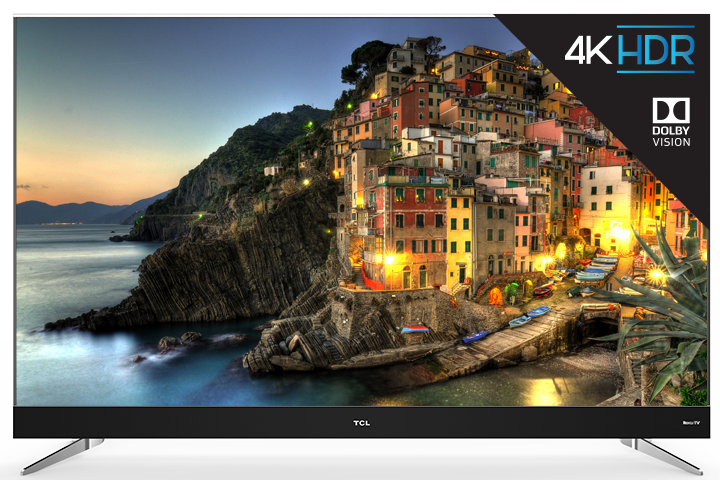 If you’re unsure about how to determine the best screen for you, take a look at this blog! It provides an in-depth explanation on ratios and distance to give you a sense of the various options you can choose from. Once you’ve got an idea of what you’d like, keep in mind that technology and screens are rapidly advancing these days. There are many high-quality products out there- it’s only a matter of finding them! Luckily we’ve already hunted down a couple of our top picks for your convenience. While screens are essential to the viewing of any TV show or movie, what really makes the experience memorable is the premium seating. 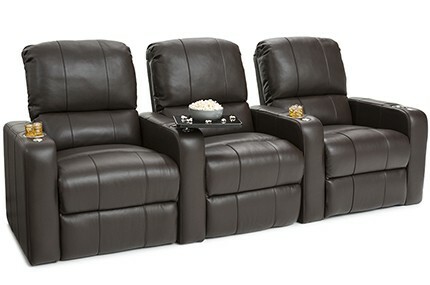 There are many configurations that can come into play when setting up your home theater. While it may seem like an unsolvable puzzle, especially if you’re working with a large family and small space, there are tricks and tips on how to bring the room come together. Keep the wallhugger feature in the forefront of your mind as you begin your browsing. They provide a great way to be efficient with your space since it allows you to place reclining seating as close to the walls as possible! The Seatcraft Millennial is a great wallhugger option made with top grain leather that comes in both black and brown. Another seating related decision has to do with color schemes. There are certain factors to take into consideration when choosing a color for your seating. Do you want it to be the main focus of the room? The centerpiece? Or, would you prefer something neutral to allow another aspect of the room to take all of the attention? To give you a better sense on how to make these decisions check out our guide to selecting colors blog! Finally, there’s the remaining issue of style. What style are you going for? The seating you select will project a message about the theme of the overall room. 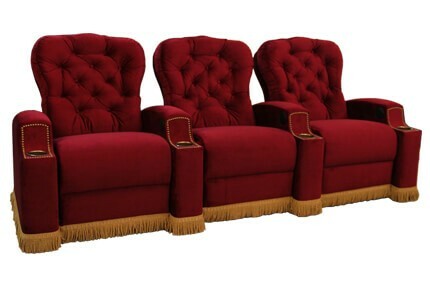 If you’re looking to bring back that classic Hollywood glam, consider the Seatcraft Regis. It comes in 95+ colors and can form both straight and curved rows making it adaptable to a variety of spaces! There are many different audio options from soundbars to stereo speakers and surround sound. What’s the difference between them? Well, while soundbars can be great for small spaces, true audiophiles will want to consider a full surround system. This will require figuring out the best placement for your speakers in relation to your seating. You’ll also want to be mindful of cable clutter– nothing makes a room look more hectic than a jungle of cables hanging out from the walls! If you’re having difficulty with your cable clutter, don’t worry. There are easy solutions that can make your mess disappear and keep all of your cables organized. 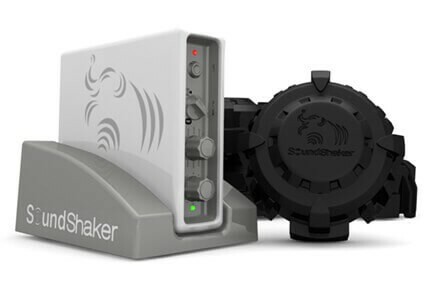 One way to take your home theater to the next level is with SoundShaker technology. This kit uses wireless audio signals to make your seat move along with the action in a movie! For those of you who find yourselves wishing you were fighting crime right alongside your favorite superhero, this feature will bring you a step closer. Congratulations, you’re almost done setting up your very own home theater! The last step to making your cinema-related dreams come true is decor. If you’re in need of some inspiration, take a look at some designs we love. There are so many unique ways to transform a space into your own personal movie watching haven. You could incorporate an accent wall, floating shelves for DVDs, framed movie posters, and so much more! There are no right or wrong answers with this one, here’s your chance to really have fun with it. Now that you’ve built the perfect home theater, it’s time to start the show. If you’re looking to personalize the experience even more, consider accessorizing your seating with fun additions such as a wine glass caddy or swivel tray table! Once you’ve added those final touches, invite your friends and family over for a viewing of your favorite movie. After all, you’ve got the nicest theater around! This entry was posted in Home Theater on November 28, 2017 by seatcraft.